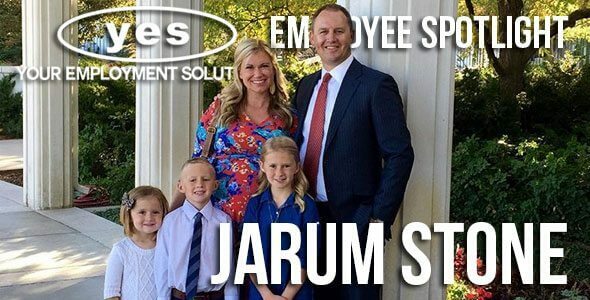 April 2016 marks the 16th work anniversary for one of our most knowledgable employees and a very high performer at Your Employment Solutions, Jarum Stone! We value Jarum every day of the year, but it seems fitting to have him as our Employee Spotlight this month. Jarum has held a piece of every position that has existed within YES and has done an amazing job with each of them. He currently resides as our well respected safety manager and company trainer. He is an amazing role model and such an integral part of our team. Who knows where we'd be without him? I'd rather not find out! Date nights every week with my wife, spending time with my four kids, golfing, spending time outdoors, and watching sports. Getting into arguments, insensitive people, and calls from telemarketers. My co-workers are amazing! I love coming to work to hear about their days, listen to their concerns and help them find ways to enjoy their job. I also love that what we do is help people find jobs to provide a living for themselves and their families. I would enjoy working at YES more if we were four times as big, with four times as many co-workers, in four times as many states that would allow me to travel a bit more and associate with so many more awesome people! Jordan Spieth is my new favorite golfer and I’d love to meet him and spend a day golfing with him. Then to be able to play with him at Augusta would be the cherry on top! Well, someone not familiar with a Southern accent might mistake it for British but I would warn people not to make snap judgements on the origin of the accent or your coworkers might NEVER let you forget that mistake. Ha! Classic! One of my responsibilities at YES is to handle safety and it’s a lot of pressure to worry about thousands of employees in hopes they follow their training and don’t make a mistake that could cause them to injure themselves or someone around them. Continual education and communicating with the employees, their supervisors and upper management to ensure safety is a key value everyone can embody so they always stay focused on preventing themselves and others around them from becoming injured. 1st) If someone is looking to work as a staff member with YES I would tell them to get in line! :) We have such a rewarding job helping people and have an entertaining work environment that most people would love to work for YES! 2nd) For someone looking to get hired by a staffing agency, YES is the only agency with certified staffing processes that ensure we match the right employee with the right employer in order to foster a long-term employment relationship for both parties! Win-Win! 11. How many times have you beat the president and vice president of YES Reed Laws and Kerry Westenskow in golf? I think this was a trick question! Ha! To be honest, very few times. However, if you had asked: How many times have Reed and Kerry driven the ball farther than you? The answer would also be very few. Who needs finesse when you have POWER! They’re totally jealous! Thanks for all that you do Jarum. You're amazing! Thank you for all that you do to make Your Employment Solutions the best staffing agency in Utah!